The medium curls style is Vanessa Hudgens’ choice for celebrating femininity. Softly cascading curls framing beautiful flawless sun kissed skin is a perfect style to emulate the summery feel. The medium curls allow for versatility ranging from soft loosely hung curls to a more defined look of a pulled back swirly updo style. For the more dramatic impact, a few tendrils of the curls can be left simply dangling down one side of the face to add to the alluring aura. 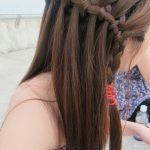 By applying, some mouse to freshly washed hair and simply running the fingers through the hair will help to keep the shape of the curls under control. This medium curly hairstyles is great for girls with oval or square or round face shape. 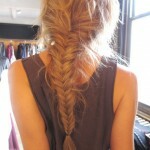 Under: Popular Hairstyles Cute Braided Hairstyle for Girls: Fishtail Braid!! !